Mix rice, tomatoes, bell pepper, black beans and corn. 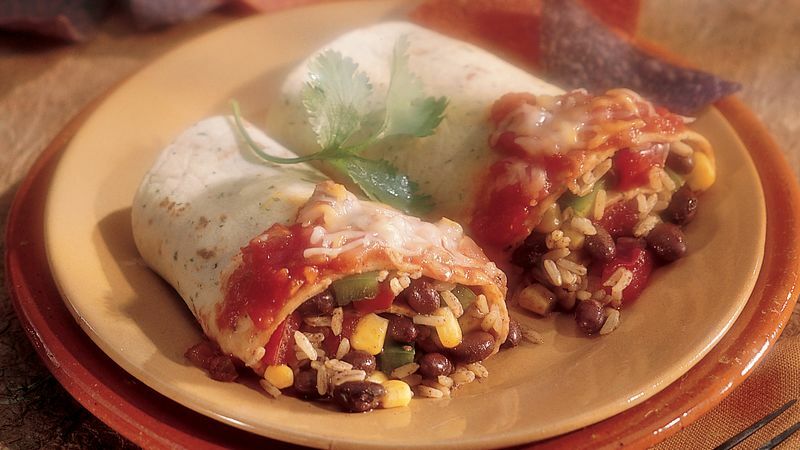 Spread about 1 cup rice mixture on each tortilla; roll up tortilla. Place seam sides down on salsa in baking dish. Spoon remaining 1 cup salsa over tortillas. Sprinkle with cheese. Cover and bake 30 to 35 minutes or until heated through and cheese is melted. For more spice, use the new jalapeño- or cilantro-flavored tortillas available in the supermarket. Store brown rice in an airtight container in a cool, dark place for no longer than 6 months. Because of the oil in the bran layer of brown rice, refrigerate or freeze it for longer storage.